The U.S. Postal Service is currently seeking companies that can provide “assorted small arms ammunition” in the near future. The U.S. Postal Service joins the long list of non-military federal agencies purchasing large amounts of ammunition. “The United States Postal Service intends to solicit proposals for assorted small arms ammunition,” the notice reads, which also mentioned a deadline of Feb. 10. Ironically the Postal Service isn’t the first non-law enforcement agency seeking firearms and ammunition. Back in July, the National Oceanic and Atmospheric Administration also purchased 72,000 rounds of .40 Smith & Wesson, following a 2012 purchase for 46,000 rounds of .40 S&W jacketed hollow point by the National Weather Service. That seems excessive considering that JHP ammunition is typically several times more expensive than practice rounds, which can usually be found in equivalent power loadings and thus offer similar recoil characteristics as duty rounds. Including mass purchases by the Dept. of Homeland Security, non-military federal agencies combined have purchased an estimated amount of over two billion rounds of ammunition in the past two years. Additionally, the U.S. Army bought almost 600,000 Soviet AK-47 magazines last fall, enough to hold nearly 18,000,000 rounds of 7.62x39mm ammo which is not standard-issue for either the U.S. military or even NATO. It would take a Lockheed Martin C-5 Galaxy, one of the largest cargo aircraft in the world, two trips to haul that many magazines. A month prior, the army purchased nearly 3,000,000 rounds of 7.62x39mm ammo, a huge amount but still only 1/6th of what the magazines purchased can hold in total. The Feds have also spent millions on riot control measures in addition to the ammo acquisitions. Earlier this month, Homeland Security spent over $58 million on hiring security details for just two Social Security offices in Maryland. DHS also spent $80 million on armed guards to protect government buildings in New York and sought even more guards for federal facilities in Wisconsin and Minnesota. While the government gears up for civil unrest and stockpiles ammo without limit, private gun owners on the other hand are finding ammunition shelves empty at gun stores across America, including shortages of once-common cartridges such as .22 Long Rifle. 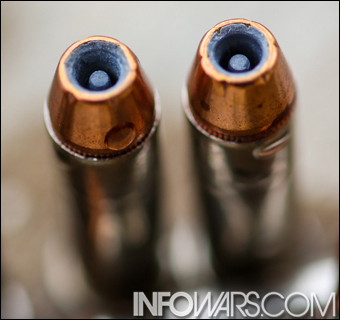 I sure hope those hollow points have Hamas, Muslim Brotherhood, Al Qaeda, and Taliban written all over them. Have they never heard the term “going postal”? This just doesn’t sound like a good idea to me.